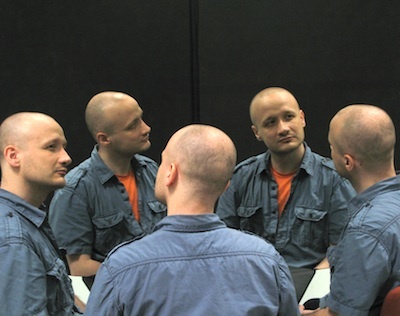 Paweł Janicki (1974) is an independent media artist, interactive director and producer working in the field of media art, microsound aesthetics and algorithmic composition, is a creator of audiovisual interactive systems, installations and performances. He creates and continuously develops software tools and interfaces. Special place in his activity takes developing software according to his own projects – and broadly – creating his own media either sabotaging already existing solutions. Among his realizations there are time-line based and interactive soundtracks commissioned for radio, television, interactive media, visual works (like a fractal for dimensional animation and and a number of title sequences and motion graphics); interactive works that are uneasy to classify, consisting of improvised sound, live programming, communication protocols, hacking. Janicki's musical projects have been presented in several publications showing the achievements of European experimental and electro-acoustic music scene, in addition he has worked in cooperation with many artists, as well as the IT industry and educational institutions, including the media faculties of the leading Polish art schools, like the Intermedia Faculty of The Art Academy in Poznań (Poland). In 2004 his internet musical performance Ping Melody was awarded the netarts.org grand prize by the Machida City Museum of Graphic Arts in Tokyo, and was nominated for an award at the Viper International Film, Video and New Media Festival in Basel. These and other projects by Paweł Janicki were presented at many prestigious festivals and events devoted to contemporary art, including the Ars Electronica, the Transmediale, the Centre Pompidou and the International Media Art Biennale WRO in Wrocław. The Society of Algorithm lists his net performances among the events crucial to the development of this genre of art.